What are the Rhythms of Work and Leisure? Early in 2011, we were unable to find a house in Madras with decent ventilation and ample sunlight within our budget constraints. At some point, possibly out of sheer frustration, Anushka suggested that we should just take all our house deposit money and any other money that we might have and use it to just travel. Iswar jumped to the suggestion and thought, why not. Of course the real conversation was much longer and inundated with emphatic language that usually requires the use of ASCII characters. Nevertheless we decided to sleep over it and see if we were still serious about it the next morning. And of course since you are here, reading this, you might have already guessed what happened. The next few weeks went by in a bit of a daze. There are multiple versions of what happened then. Some versions have paranoia whilst some have moments of intense soul searching, some say we were moving so fast that we were a blur - maybe we had lost focus. One popular version is that we immediately sent out a mail to all our friends and family, informed them of this decision to travel and asked if they would like to make a contribution, financial or otherwise. By now we had also decided to film the journey. We weren't really sure what we would film, but we had a camera so we thought we should take it along and see if we could make something of the footage at the end of the journey. In two weeks we had received a substantial sum to begin our journey with, and many many mails and calls and messages wishing us the very best. The planning took barely ten days. We wanted to ride the momentum and not spend too much time planning, as there was the very real fear of not going through with this. The idea now was to spend six months travelling around India - to any place that we wanted to go to and to do anything we felt like doing and to meet hundreds of people doing hundreds of things and oh the possibilities were just endless. On the 1st of March we left Madras for Delhi as a friend of ours offered to get us a brand new camera. Iswar had never handled a camera before so it would be exciting for him to be learning and playing with a camera while travelling. And a 2-camera set up was too good an opportunity to miss. We waited for nearly ten days in Delhi for the camera but some delay or the other kept happening. We were getting itchy and felt the momentum slipping away. But the good thing was we got some time to set up a travel blog at www.somethingwehavealwayswantedtodo.com . If you think that’s a long name for a blog, feel happy that at least you don't have to type the entire thing every time to sign in. This time was also used to make contact with the Archive and Research Centre for Ethnomusicology (ARCE) at the American Institute of Indian Studies in Gurgaon. Gautham, a friend of a friend who also happens to be a film maker suggested we take a look here. He told us, “every time I go there it does something to my head and changes the way I am conceiving a project.” We felt that was just what we needed and since then the ARCE have been an integral part of our work. ARCE has extensive archives of music recorded on virtually every technology that has existed in the last hundred years or so, and the means to listen and watch all of these. It also has a wonderful staff whose passion for music is infectious, and their combined knowledge of the material in archives is not replaceable by the fanciest of search engines. At many stages of our work, we have returned to look through the archives, pick their brains and generally find new inspiration to continue. Nearly ten days after reaching Delhi, the camera still hadn't come, and we had two weeks left before we had to rush back to Madras for a performance of Ms. Meena, a play that the two of us have been acting in since 2010. So we decided to travel with just the one camera we had. But we had to decide where to go. All the metros and other big cities were the first to be ruled out. We have many friends in these places so we could always go there. It was March, the weather was pleasant and not too hot. This was the first time the two of us were backpacking together so we thought it might be better to go to a place which is easy to travel through, and is used to seeing cameras. And that’s how we decided to begin our journey with Rajasthan. Iswar had this idea to ask someone to donate an object, a gift. This gift would be given to the first person we stay with and then we would ask them for a return gift that would be passed on to the next person we stayed with and so on. The first gift we got was a wooden flute from Anushka's sister Krithika. This was handed over to KP, a friend whose house we stayed in Delhi He in turn gave a pen which was handed over to Amit, a couch surfer we met in Jodhpur. He gave us a jelly candle in a shot glass, one that broke in our bag and spilt all the gelatinous wax. And that was the end of the great object exchange idea. We had considered starting with a brand new object but the look of terror on KP and Amit's face when they were asked to think of an object they would like to give away seemed like undue pressure. Since then we have been handing over a thank you note to people we stay with. From the moment our train pulled into Jodhpur we pulled out the camera and started filming. We had a few discussions in Delhi about what this film might look like. We knew we wanted to meet as many performers as we could; we hoped it would in some way tie into the work we both do with the theatre collective we are part of. But how was all this going to come together as a film? One obvious idea was to use ourselves and our journey as a thread. Although this wasn't particularly exciting for us we decided to film each other walking, travelling and maybe talking - just in case we wanted to use it. One of the many perks of digital film making is you don't have to worry about the cost of filming too much. We walked around a lot in Jodhpur. Fortunately both of us enjoy walking. So long days would be spent walking around through the city, through the market place, through residential areas. On one of these walks we found a signboard that read Babu Superman. We were obviously tickled and so pulled out the camera to take a photo, when a man watching us asked us, “aapko Superman se milna hai?” (do you want to meet Superman?). Babu Superman turned out to be an 80-odd-year old retired wrestler who runs a tea shop. We didn't know why, but his seemed like an interesting story so we spent a few hours chatting and filming with him. There are stories everywhere, and it is especially exciting when we happen upon them by chance. The tricky part of course was to create a balance between these serendipitous stories and stories that are actively found due to research. The internet and the ARCE were a big help here, and so was our blog and online presence which enabled our audience to suggest stories. In fact, right through our journey, friends and strangers have told us about places to go to, people we can stay with, or suggested a performance form that we should film. But in order to make use of these suggestions, we needed to have some clarity about what we were looking for. While travelling, people usually suggest visiting the closest fort or a lake. These are nice to look at but are not really dynamic and we honestly till date have no clue of what to do with visuals like that. We have put up one such series, filmed in the Mehrangarh fort in Jodhpur. An exceptionally beautiful and extremely well maintained fort, but most of our visuals are of each other walking through that space. So meeting performers was our easy way to create a rapport with a space and its people. We had something to talk about, and we hoped that along the way we might learn something that would feed back into our own work. Funnily enough, Rajasthan was a difficult space to search for performers. We once asked to meet local “kalakars” and were told that everybody here is a “kalakar”, so we had to narrow down our search. We decided to look at theatre, and this took us in the direction of Pabusar, where we were hoping to get a glimpse of the stories of Pabuji – an epic usually sung at night and accompanied by panels of illustration on a large cloth or 'phad' that are illuminated by a lantern. But we got distracted along the way and decided to stop over at Khinchan, a tiny village on the way to Pabusar, where the Jain community feeds thousands of migratory Siberian cranes. Filming these large birds, we started getting quite excited about filming flightand other kinds of movements, including rising dust storms, and shadows, and suddenly all of these began to suggest to us the idea of travel. As we travelled, we also began doing spot interviews of each other, generally introducing a space, sort of like hosts in a travel show. By now it was nearly the time for Holi. And many people we met had said that we had to experience Holi in Jaisalmer. Jaisalmer was gearing up for Holi and was looking very festive. We filmed large congregations of men singing and trying to outdo each other with their vocal stylings. It was as one would expect Holi to be, set to the backdrop of a centuries old fort and temples. Most of our worry here was to keep the camera colour and water free. Iswar, as we mentioned earlier, was operating the camera for the first time. He remained convinced during this entire period that the camera was an extension of his body. So he moved around freely while filming, doing sweeps and turns and zoom ins and zoom outs at the same speed as his eye would move, jumping from one thing to the next. This ensured that pretty much all of the footage was unusable due to excessive camera shake. What little we do have from this section of our travel that remains of some use are those rare moments when Anushka put her foot down and took the camera away from Iswar. During one of our many walks we struck up a conversation with a little girl who took us to her house, which turned out to be inhabited by a family of puppeteers. Ramesh comes from a family of puppeteers and puppet makers. He sat in one corner chiselling away and working on newer puppets meant for sale, while the rest of his extended family kept coming in to sit and have a conversation with us. Before we knew it, a baithak of sorts had begun, with Ramesh’s 12 year old son Raju at the helm. Sounds of traffic, of songs, of chiselling and laughter continued for the next few hours. They invited us to their performance that evening at the Desert Cultural Centre. Although we enjoyed the performance, what we really loved filming was the family as they work and sang together in their space. Post Jaisalmer we came back to Madras, and tried to edit something with the footage in Rajasthan. We had major computer woes, so nothing happened. Well not entirely nothing: Iswar couldn't see his own footage without getting a headache, so he decided to listen a little and steady the shots. In theory at-least. Once our shows were done we headed back to Delhi and this time the camera had arrived. A spanking new Sony alpha 33 with a flip out LCD. A note to all digital film makers, the flip out LCD is one of the best things to happen to a DSLR that is going to be shooting a lot of video. The great thing about the Sony camera was that we could also shoot the video through the viewfinder, an absolute boon when dealing with low battery issues. It was getting really hot, so we decided to get away to Himachal. The starting point was to be Mcleodganj. But in order to get there we took the toy train from Pathankot. Anushka was ecstatic to finally have a camera that she didn't need to steal from Iswar. Although she has been a documentary filmmaker for nearly nine years, this was the first time she was using a DSLR. We filmed a lot in the toy train, shots of movement, the rhythm of the train, the shadows, the train turning, people sitting on footboards, approaching bridges. In Mcleodganj we saw a poster for a Butoh performance at the Subbody Butoh School. Here we met a fantastic teacher of Butoh, Rhizome Lee. We filmed a performance at the school and another street performance by some of the students of this school. One of the students was Honza Svasek, a 60 year old visual artist from Rotterdam. He organised these street performances on a weekly basis to try and take this form out of the theatre space and directly to the people. But at the end of it we ended up feeling a bit hollow. Yes we had filmed a performance, and also had some background information to go with it, but it seemed unfair to the form of Butoh. This is when we started asking ourselves about questions filming with performers: What exactly are we trying to do? Is this film going to use other people’s performances to create our own video performance? Can we really show these forms without their context? Is it fair to the form or to the performers? In a few days of filming, can we really get at anything more than impressions. Is this enough? We continued to search for performers though and started thinking of ways in which we could engage with them and not just observe, to try and turn the interaction into something personal. We found Ramu, a flute seller originally from Nepal, who also teaches and gives flute lessons mostly to tourists. We thought that maybe one of us could learn some basics from him and keep practicing over time. Although we had two cameras by now, one of us would usually talk to the people we were filming with while the second person filmed. This allowed one of us to be in the story and also helped put the person we were filming with at ease. Who talks and who films would be decided on the spot, sometimes based on the language (Iswar speaks fluent English and Hindi and a smattering of Tamil, while Anushka speaks fluent English, slightly better Tamil and very hesitant Hindi), and sometimes on gender; but most of the time one of us would automatically start talking while the other started filming. The flute idea never took off, as Iswar was the one learning it and not particularly keen on practicing, and also because it meant we were turning the camera too much on ourselves and not on the world outside. We realised that weren’t interested in being travel guides or making a document of our relationship or of ourselves as film makers and travellers. Through a few more friend-of-a-friend circuits we landed up in the village of Raison between Kullu and Manali, and filmed with a music teacher in a school, Chandrakiran Upadhyay, who used to be a state level volleyball champion. By now music was coming in to the film in a big way. It was easier to film with musicians, than for instance, stage actors. We didn't need to organise large groups to get together, and language and context was useful, but not essential for us to enjoy and connect with the music. From this point on, we started asking specifically for musicians. We had heard about the Spiti Valley from Sachin, one of our funders and co-actors. He had spent a few weeks there and highly recommended it - a high altitude cold desert with a landscape similar to Ladakh but not as 'touristy'. The Rohtang pass hadn't opened so we took the much longer route via the Jalori pass and got to Kaza. We got in touch with an NGO, Ecosphere, which also works with the local craftsmen and performers. This is something we now often do – many local NGOs have very enthusiastically helped us locate the kinds of stories we are on the lookout for. This, in combination with walking and keeping our eyes open, usually lands us in some place interesting. In Spiti this combination took us to Tulkuji, a retired water pump operator who spends all his time in the winter months travelling around the Spiti valley and teaching people their own local music. The Spiti Valley and the interaction with Tulkuji remains strongly etched in our memory. It was one of those rare periods where we got to experience the joy of travelling as much as that of filming. This was one of the first spaces where we realized the need that many communities feel to record and document their own culture. We also came to appreciate how important 'dressing up' can be for the people we film with – much more than it is for us. We don't usually ask people to change into their fineries or place them in the most stunning space before filming. But for many people, this is important as they want to portray themselves and their culture at their finest. Tulkuji had asked us to explore the caves on top of the hills in Tabo. These were caves used by Buddhist monks to meditate over long periods of time. Sitting outside the caves and looking out at the expansive landscape we saw a dozen or so farmers working on the fields. They were working in formation, forming these lines every now and then and even from a distance we could see a sense of rhythm at play. Every now and then the breeze would carry with it some laughter and strains of a repetitive melody. Were they singing while working? We came back downhill and decided to go investigate. And sure enough, the group of farmers, mostly women were breaking mounds of soil in a collective movement, and singing while they were at it. After a minute or so they would stop, and then resume again a few minutes later. Anushka decided to join them while Iswar filmed. There was so much beauty to what was happening in front of us. It seemed like a performance but not meant for an audience: the collective energy, the strong lines, the dance-like footwork, the hypnotic swing of the shovel, the song - and here it was, happening in something so 'everyday' and by a group of 'regular people'. We came back to our hotel, and spoke a lot about this in our subsequent meetings with Tulkuji and with others at Tabo. But it was so regular and normal, that no one gave it much importance. And so, neither did we. We had witnessed something beautiful and that was that. At the end of nearly ten days the time to leave was fast approaching. Our time in Spiti had been split up between Kaza and Tabo, but we had heard a lot about Dhangkar, the old capital of the Spiti Valley. So we hitched a ride and walked and hitched a ride again and got to Dhangkar in the evening at about half past five. The village of Dhangkar is spread out over a horizontal U-shaped mountain. While walking from one end of the U to the other, we heard some rumbling sounds and some bleats. We looked around and found hundreds of yak, donkeys and cows coming towards us. These animals crossed us and began to spread out across the landscape. We just stood there absolutely amazed while 300-400 of these animals walked to their own respective houses without a single human being in sight. Within 15 minutes, hundreds of sheep and goat also joined this medley. This entire dance lasted a mere 45 minutes, and we were possibly the only humans about. It was peak hour traffic time and we were the tourists stunned in the headlights. We found ourselves a room to stay and decided to film this the next evening. We didn't think even once of why we were filming animals. We had set out to film 'performances' and anything else we found interesting. Well this was both. We found ourselves a few decent vantage points the next evening and filmed this explosion. We were both visibly excited about what we had just seen and filmed. We had no idea what we were going to do with it, or how we were going to edit it, or if this would even interest anyone. But in a strange way it made sense. We made a few more quick trips here and there and returned to Madras. We took a small break and did a few more shows of Ms. Meena, and got around to going through the footage. Now we had a few hundred GB of footage, so it was important to try and edit something with all this to see what the footage looked like. As you already know we had used our house deposit money to travel, so we had no house, and this is where the strong pillar of support that our friends have been came into play. We stayed in a friend’s house and ate in another friend’s house. A number of these friends would come over and we would start showing them some photos and footage from our journey. A strange thing happened, which we didn't recognize at that time: we were most excited while showing footage from the cattle in Dhangkar and from the farmers working and singing in Tabo. We showed other things too, but these two were what we and our audiences were getting most excited by. Editing all this was turning into a nightmare. Our computer kept crashing. When it worked properly, we were having trouble as one camera was Nikon and the other a Sony. The file formats were different, the frame rates were different, and that created a whole lot of technical confusion. Iswar has been acting in films of the students of LV Prasad Film and TV Academy since it started, and so we decided to call and ask them for help. Ranjith, the editing professor at the Academy, immediately offered the editing studio free of cost as the Academy's contribution towards our film, and also put two students Aalap Majgavkar and Arnav Das to work with us. We handed over all our footage which they converted and transcoded over two weeks, while we made a kilo or two of flash cards that described the shots and sequences from our footage and started working on the structure of the film. We began by segregating the shots and sequences by space, and then tagged them based on various themes: colour scheme, the kind of movement, shadows, animals, forms of transport, landscape etc. Then we spread them all over the floor and rearranged them multiple times to come up with a sequence that told some sort of story. In fact these are the categories that we continue to use every time we relook at our footage, and that are used to sort our footage here in the pad.ma archive. In the meantime Arnav and Aalap had gotten some time to play with the footage themselves and come up with a few possible edits in each of the stories. We edited for nearly two weeks and incorporated a lot of the feedback and ideas and came up with a 17-minute long film, cleverly titled as 'Our First Film'. Our First Film from Anushka on Vimeo. The stories that we found ourselves getting most excited by were the ones that were non-verbal. Some of these were sections that we hadn't even thought of as significant content while we were filming them. The cattle in Dhangkar was one of these. Another was the reactions and gestures of school children as Chandrakiran, the volleyball teacher taught them music. The film finished with a montage of us travelling - a section that we weren't too thrilled by, but which we kept as we were also using this film to further fundraise for our travel. We shared this film widely online and a lot of people wrote back to us. Our journey seemed to be the most exciting aspect for many. Some people got excited by the farmers' song at the end, some by the expansive landscape shots peppered with cattle. Some suggested we add even more of ourselves and bring in more of the dynamics of travel and filming, while some recommended we try and move further away from it. One thing that became absolutely clear for us was that we were now going to be actively looking for stories with a strong performative quality to them. We wanted to try and find 'performances' outside of the conventional performance space. Our next destination was the Valley of Flowers. But after many days of travelling to get there, we found ourselves barely filming. We took many photos but hardly filmed anything except for a few time lapses of clouds. We didn't know what to do with such a beautiful space, perhaps because of the lack of people. From there we went to the village of Lata and found out that it’s close to the village of Reni, where the Chipko movement started. We were in a space of great historical significance, and some of the women who participated in the movement decades ago were still alive. We met one of them Bali Devi, and she sang some songs of protest from the Chipko movement for us. Ranaji, the man we were staying with in Lata also sang us some marching songs from one of the environmental movements he had been involved in, and we spent much of our time talking to him about the forest and his people's access to it and the Nanda Devi Sanctuary. Many months earlier a few of our friends had expressed the desire to visit the North East. We planned it in such a way that the two of us would also travel there the same time as them. And so the five of us met at Guwahati and began our journey in Shillong. Anushka had already been to Shillong a few years earlier and had spoken about the lottery system there. A group of archers fire arrows at a target placed 20 metres away for around 4 minutes, and the number of arrows that hit the target are that days lottery number. This was a lovely story – with a strong sense of rhythm and flight, and we spent two days filming it. A few hours away was Nongriat where we went to see the living root bridges. These are basically bridges made by joining roots of a banyan tree from one bank to the other, and over time they thicken to form a stunning network of sturdy 'living' bridges. Just as in the Valley of Flowers, we couldn't think of a good way of bringing these bridges into our film. We filmed ourselves walking over them, but it felt so stupid that we abandoned the idea. We did however manage to film a number of large colourful spiders. Just as with the animals in Dhangkar we instinctively felt that these creatures had a space in our film, somewhere. Filming nature has became integral to our work since then. Write about animals becoming people. But overall, we filmed very little in this one month that the five of us were travelling. The focus was more on us travelling as a group rather than the film we were working on. We travelled through Meghalaya, Mizoram and Manipur without filming much. In the weaving town of Thenzawl, in Mizoram we observed and filmed the complicated, dance-like footwork that some of the women did while weaving the puans. Half an hour into filming we started hearing a lovely rhythm. The three women who were working each had on a set of headphones and were obviously listening to some music while working. And once the weaving patterns became simpler they were able to increase their speed of work and in it we started hearing the movement of a train. In Manipur our search for musicians landed us at the doorstep of Rewben Mashangva. What excited us most was that he had created his own genre of music, Naga Folk Blues. He took us to meet an old couple that he learns from, who he calls the 'old guys'. The songs that the couple sang were hypnotic harmonies and chants. Some of these were songs that are sung while working, while some are ritualistic, and there is no one else left who sings these songs. We filmed Rewben and the old couple, Shampang and his wife, making the decision that perhaps some of this content could go into making shorter films, stories of some of the wonderful musicians and performers we met along the way. Our friends had left by the time we reached Nagaland. Rewben had asked us to look out for a group of sisters who sing in Kohima. We walked into a sound recording studio and asked for these sisters and got to meet the Tetseo Sisters. One of them, Azi Tetseo was getting married in two days time, and we got invited to the wedding, and eventually, to stay at their house. We filmed the preparations for and the actual wedding itself, and later, we filmed the Sisters singing and also filmed conversations with them and their parents. They were also getting ready to release their first music album and allowed us to follow them around during their photo shoot. In retrospect we hardly thought about our film at all while filming there. We had just been generously invited into this family, especially during such an important time, that we tried to give back in the only way we knew how to, by filming. At the wedding, someone we met told us to visit Phek district, and made arrangements for us to stay there at the government guest house in Phek village. A very interesting thing happened in the village. This was one of the first few places we went to where we couldn't really converse with everyone either in English or Hindi. So it was getting difficult to explain what we were doing and what we were looking for. Fortunately we had our 17-minute film with us. Our friend, guide, and translator in Phek was a school teacher. He allowed us to screen the film to all the batches in the school from 4th to 10th std. For the first time we felt even the few bits with talk and subtitles were way too distracting. But something was working. We had their attention. The teachers were pointing at various things in the video and connecting it to what they learn in school. At the end when asked for suggestions, almost all of the students told us to go visit their fields and see how the farmers work. The music that we heard in the Phek fields was outstanding; multi-part harmonies while people carried 70 kg sacks up hill. Chant like drones when they winnowed, bursts of sound while they jumped and thrashedrice. It was amazing. It seemed so natural. We started looking at gestures, at these minute movements, at these large 'choreographed' formations, the entire space had turned into a stage. Here too like in the Spiti Valley, most workers were land owners themselves. People who had immense pride in their work. The joy they felt while working was infectious. We were no longer just asking ourselves why do they sing, but why have we all stopped singing. We landed up next in Majuli Island at pretty much the peak season, during the annual Ras Leela Festival. The journey to get there, over the Brahmaputra in the evening while the sun set was undoubtedly one of those truly magical things. We were very fortunate to find a room when we got to Majuli. We heard that the Ras Leela is an all night event, so we decided to sleep in and rest well. When we finally woke up for lunch, our hotel manager mentioned in passing, 'oh I was wondering if I should wake you up but then you seemed to be fast asleep so I let it be, you see this morning about 5000 fishermen went out to fish together, it happens only once a year'. Well that is one of the things you need to come to terms with, some you get and some you don't. What stood out in Majuli were the few days we spent filming with Goswamiji, a master performance mask maker. There was also a certain quality to the working style in his space that really caught our attention. The central focus was on this mask getting made, but somewhere along the line we found ourselves getting really attracted to the mood of the work space -the level of concentration, the silences, the spontaneous jokes and laughter. We travelled through Arunachal really thanks to the kindness of friends, for by this time we had very little money left. But somehow a network of people kicked in, and we were hosted by a number of wonderful people. While filming there, the rate at which languages and songs were being wiped out slowly started to sink in. We filmed with Dibuli Miuli - an old woman who sang us weaving songs in Roing, and a couple in Luiliang, who sang ritual songs, we even managed to spend a few hours filming with a few members of an all women's theatre troupe in Chongkham. Everywhere we were told we were filming with people who were the last to know the songs, or the last to understand their language. We finally returned to Madras after our longest stint of travel, almost 4 months spanning 7 states. We moved into a friend’s house and set up our work station and started looking at all our footage. The laptop we travelled with didn't play HD footage, so we were looking at all of this for the very first time on a big desktop screen and making notes. We had to come up with a name for the project, and we were very keen to have a name that came out of our travels. We thought of many names, profound, silly, incomprehensible, mono syllabic, what not, and then we finally did something sensible, we asked some of the people we had filmed with. The name that totally got us, as you might have already guessed, was u-ra-mi-li (the song of our people, in Chokri - a Naga dialect). This was suggested to us by Mercy Tetseo, from Kohima. We decided to do something small this time, trailers maybe. We started thinking about what a film based entirely on people who use rhythm and music in their day to day lives might look like. Here are the trailers we created. Almost a year after we began our journey, we came across the term 'work song'. We have since then been actively searching for and filming various kinds of work songs and work rhythms. The song of the cattle herders in the Nilgiris, to the ship builders in Kutch, the Toda songs of embroidery, to the rhythmic sounds of a hand powered lathe in Tamilnadu. If you can think of any or chance upon any songs and rhythms of work, please do get in touch for we would love to go and film it. These work songs call out to us because of the strong performance-like quality inherent in them. The ability to turn the ordinary into something magical, and where the ‘boring’ nature of repetitive work turns into something really interesting for the worker and the observer. The word ‘work’ itself rarely conjures up happy or energizing feelings. Work is more or less looked at as something that one must do, for whatever reasons. At a time like this, it is refreshing and reassuring to see people go about their work with a sense of joy, a tune on their lips and a hop in their step. This is so infectious that we as observers have felt like joining in and working. Not to finish some work but to enjoy the work. To feel a collective energy and a cohesion with something much bigger than us. These songs are not just tuneful melodies, but a way of living and thinking, a state of mind. Even in oppressive spaces, work songs exist to set the spirit free, as in the case of the prison songs or songs of enslaved African American workers. Here, in India, we have filmed songs of protest calling out loud and demanding change, where people cannot work the way they want to or deserve to. These songs die on a daily basis. Sometimes it is due to mechanization, where a diesel engine comes on a boat and almost immediately murders the rowing and boating songs, or a tractor comes and kills all songs of field preparation. Lifting and pushing songs die with cranes coming in. Few people can do the job of many and there is a much higher yield and better productivity. Communities slowly disintegrate and people work to get the work done, not necessarily because they enjoy it. At a time when we find ourselves getting more and more alienated from our own neighbours, the relevance of a song that brings people together grows in meaning. We wish to document some of these songs but we also wish to be moved by them. We continue to crowd fund and take up commissions and jobs in order to fund our travels. We have in the last year received a fellowship from pad.ma and a research grant from the India Foundation for the Arts to work on a film specifically on the work song culture in Phek village in Nagaland. A full length feature from our work in Phek Village should be ready by the end of 2014. This film gives us an opportunity to take an in depth look into why people sing when they work. Phek village is a space which is immensely rich in work songs. There are 17 categories of work songs for terrace farming alone, and each category has 5-10 songs. Besides these they have songs for other types of farming, pounding grain, weaving etc. This film allows us the space to ask all the questions we have wanted to about this form of song. The songs of Phek themselves are usually polyphonic in nature. We are also working with a few students from the local government school there and taking basic photography and film making workshops for them. Hopefully these student film makers will tell their own stories by the end of 2014, and we will be able to share them along with our film. We have put up our first home made website, www.uramili.in please do have a look and mail us your thoughts. It has a number of photos, write ups, and videos along with a link to our travel blog, which we really should update more often. If you would like to make a contribution, financially or otherwise, towards the u-ra-mi-li project, please do write to us at uramili.project@gmail.com and we can figure out how. A number of people have helped us along this journey by either suggesting spaces to go to or people to film with. A number of people have also put us in touch with friends or family who we can stay with while travelling. This has been incredibly useful as it not only helps us cut down our accommodation costs, but also helps us meet the local people and use their suggestions and guidance. People have also donated travel or film making equipment, and some have even offered their technical services as editors, writers, lawyers etc. Considering the scale of this project we really need all the help we can get. So if you find what we are doing at all exciting then please do write to us so we can figure out ways to work together. Thanks to the fellowship from pad.ma we have been able to share most of the raw footage from our travels in 2011. The footage has been segregated chronologically based on our travel route, and also by the camera used to film it. In most of the instances the Sony Camera is the wide angle shot, filmed by Anushka, where as the Nikon has close-ups filmed by Iswar. There are short passages that accompany the videos to help put the stories in context and to give some basic background information. Please feel free to go through them and do write to us if there are thoughts or questions that you would like to share. If you want to use any of the footage or audio, please do write to us and we will put you in touch with the people concerned to get their permissions. A lot has changed in the way we think and the way we film in the last three years. We have spent a few more months travelling in Tamil Nadu, Kutch, and a little bit in Kerala. We have also done a larger 37 minute long edit with footage from all over and screened them mostly in Chennai and Bengaluru and plan to do more screenings in the months to come. We hope to share more of our work and the process with you in the years to come. We hope you have enjoyed reading and watching and we hope to hear from you soon. Anushka Meenakshi is a filmmaker and Iswar Srikumar is an actor. 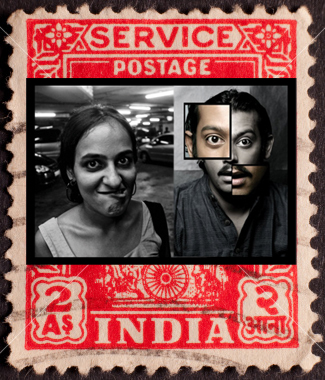 Both of us work with a performance collective called Perch in Chennai.